Like scum on the edges of a rancid pond, the Underverse of Hades clings to the periphery of the cosmos. It is a place of darkness and death, unlit by the stars that we know. 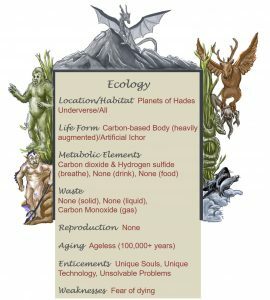 Home to many terrible creatures (and of things that do not merit even that name) Hades is peopled by perhaps the oldest race known to mortal-kind – the Shaetemmu. These beings existed even before today’s Demon Lords and Daemon Paragons, and go by many names: the Shaetemmu, Grey Ones, Death Witches, or most commonly Midnight Hags. In ages past, the Midnight Hags were a race not dissimilar to humanoids. Their technology and magical prowess grew to staggering fruition in the young universe, and they eventually shed their mortality to become beings to rival the Outsiders. With great power came great pride; freed from death and the need to carry on a legacy, the Shaetemmu ceased to breed. Eons later, only the most cruel, vicious, and vain of the ancient race survive. These terrible few have carved up the Underverse for their own, ruling the desolation with iron talons. They have an unclear relationship with the nightmarish elder beings of Hades, the Death Masters – demi-gods of nightmare. Midnight Hags are the most significant power-brokers and soul-traders of the universe, neutral parties permitted almost anywhere for the benefit of their valuable goods and powerful technology. Their unique capacity to create Larvae from Lemurian Souls and to transport those Larvae through the River Styx from world to world makes them indispensable to the power and technology of the Outsider empires. Their Witchvessels are a common sight in Outsider realms, and those seeking transport between such places are often best served by paying handsomely for passage thereon. Mortals most often encounter Shaetemmu in the course of interplanetary travel or when delving into esoteric and forbidden magical lore. The encounter rarely ends well for the mortal – Shaetemmu drive hard bargains, and always take more than they give. Unlike more biologically conventional creatures, the Shaetemmu have the expertise and inclination necessary to change their appearance without the stabilizing effects of population genetics, and make such modifications for “efficiency”, survival, and conceit. The average Hag stands taller than an Apikan but weighs far less. Superficially, they resemble wizened old women. Up close, Hags are something far more alien. Their skin does not flex like that of humanoids; it is so brittle that it cracks and reknits itself with every change of facial expression. Shaetemmu are consequently very difficult to read, since they avoid even this minor damage as much as possible. Skin tones range from corpse-white through midnight blue to rot black. Their teeth are sharp-pointed and their sunken eyes are ink-dark but glint brightly. All Hags possess some number of horns and have ferrous claws of varying lengths, though these are rarely used as weapons in any serious fashion. Surprisingly a fair proportion still retain a full head of luxurious hair as a testament to their vanity. As a race, Shaetemmu are as much defined by their technology as by their biology. 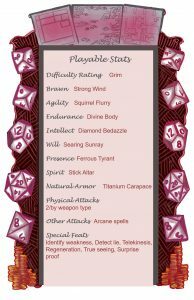 Each carries a number of wondrous artifacts, and though specifics of design and construction may vary these objects are a staple kit that all individuals maintain. They are fond of animated dress-like garment, both armor and weapon, that defends its wearer. At their waists, they often bear large and curious knives, which appear to be formed of single solid pieces of steel without sharpened edges. Each also carries a brooch set with a large and intricate jet as well as a semicircular device of unknown function. Lacking social cohesion of any kind, Hags are not identified by affiliation but by appearance; most have epithets reflecting some aspect thereof, such as “Atheme of the Longknife” and “Nalgast the Corpse”. Unlike most Outsiders, Midnight Hags are very free with their names – they are eager to be summoned to virgin markets. Perhaps the most unique characteristic of the Shaetemmu is the manner in which their biology and technology overlap. Every individual is the culmination of a long lifetime of self-experimentation. Some have a body cavity packed with a slime-like artificial organism that takes the place of organs. Others have limbs carved from articulated stone or metal, with super-humanoid dexterity and sensitivity. 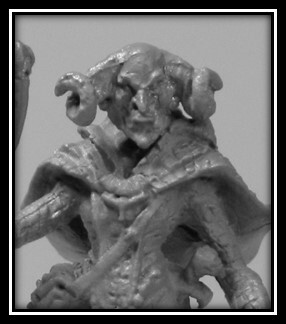 Many are equipped with artificial eyes, and even more have arcane sensors implanted in their horns. It is rumored that some even bear artificial ichor. The only truly universal modification that the creatures have undergone appears to be the use of artificial self-repairing skin, an advancement unknown beyond their dark laboratories. The aforementioned repair process and their long eons of life make the Shaetemmu reluctant to exert themselves. Instead, they have developed the ability to kinetically control objects, including their own body. The mechanism remains unclear, but the Grey Ones can fly with near-perfect maneuverability and at great speed. Even when they appear to be walking they gently float, boots bobbing just a hair’s-breadth from the ground. The strength of their telekinetic ability appears to drop off sharply with distance from their bodies, and is rarely used offensively. The Midnight Hags have advanced sensory perception nearing that of the Gods themselves. 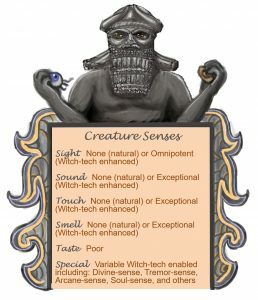 Biological limitations prevent the implantation of the most advanced of these sensors, but the creatures are still possessed of such faculties that many primitive races credit them with the ability to take the forms of other creatures: owl, wolf, and greech are synonymous with the Grey Ones on many worlds. A hallmark of the Shaetemmu are the filamentous horn implants that impart great sensitivity to air currents, smells, sounds, heat, arcane radiation, vibrations and even divine magic. They are thus nearly impossible to surprise. The creatures have become so dependent upon technology that without this augmentation, their smell, taste, touch, and hearing are non-existent in their natural state. With them, though, so sensitive are the Grey Ones that they can almost effortlessly discern the feelings of mortal-kind. More terrifying still, some Hags appear to be able to dissect weak mortal minds and pluck the very thoughts from them like ripened fruits. Even powerful Outsiders are loathe to negotiate with Hags. To further boost their internal Witch-ware, the Shaetemmu bear sophisticated items that expand their sensory horizons to incredible heights. The most common are philtres specific to the needed sense; a Hag that wishes to open a combination lock by sound alone, or to examine a specimen in microscopic detail with the unaided eye, may consume a potion that enhances the sense in question at the cost of the others. Other more complicated devices make up for true deficiencies. The staves that many bear are not only weapons, but sophisticated “sniffing” sensors that can both detect the faintest scents and determine their origin or even chemical composition. The greatest of these sensory prostheses is the infamous Eye allowing the Shaetemmu to peer through the boundaries between the realms, and see into other universes or even the Ethereal. Each Shaetemmu rules one or more of the dystopic worlds that plod through Hades’ endless night. No stars light the Underverse. Instead, each planet orbits a fixed point in space, the point of contact between the crystalline material manifestations of Positive and Negative Energies that extrude themselves into the realm. These arc-bright zones of mutual annihilation bathe the dead worlds in sickly light, and the Hags rule the twilight. What few creatures still count as “living” slink cautiously through the muck of those planets, and hide in the depths of formaldehyde-laced seas or odorous, turpentine-scummed lochs. In Hades, the dead and Undead rule – and the Hags are masters of the Undead. Each maintains a cyclopean, alien palace seemingly pulled bodily from the living rock, monolithic buildings of blank-faced, windowless towers composed of grey siltstone and seams of black anthracite coal. The flat land around them is littered with reclaimed flesh and bleached bone, waiting in low reeking piles for the Hags’ needs. Undead endlessly sort bone and flesh into meaningless categories at their master’s whim, sorting and resorting until they are needed for greater tasks. The necromantic arts are a great specialty of the Grey Ones; much of their research is concerned with the creation of Undead. Each individual creates unique types of Undead to suit her taste and needs, though groups of Hags that associate or neighbor each other tend to have some aesthetic overlap. Vast populations of these creatures are to be found on each planet. Their dizzying variety rivals the diversity of mundane life-forms found on mortal planets, with shapes that range from animated eyeballs on spider legs to hulking behemoths of rot. For those who study such things, individual Shaetemmu can even be identified long in advance by the Undead servants they send to do their bidding. Shaetemmu spend the majority of their time in arcane research and experimentation, and much of the rest on acquiring the materials and capital to further their research or attempting to undercut their peers. The Hags’ mastery of Stygian travel with specialized Witch-holes is widely known, and the mercantile empire of the race as a whole spans nearly the entire known Universe. Hags trade frequently with Daemons for the bloody fruits of conquest and slaughter, with Devils occasionally for especially notable souls, and with Demodands and Fae seldom for access to technologies that they lack. Despite this emphasis on trade in the most esoteric goods, Shaetemmu worlds are industrious in their way – countless are the Undead that work sodden mines and foundries to make the raw blanks for magical weapons, or trawl the waters of the Sea of Tears for carrion to ferry home. The only place in which the Hags regularly meet is the Sea proper, to collect Lemures and to open portals for the passage of their corpse-laden barges from the Sea to the dark underground lakes that they maintain on their own home worlds. No act is too cruel or foul to further their research, and no creature or place sacred. This disregard of other sentient life has made the Midnight Hags despised amongst most worlds, but few have the courage or might to do anything to the ancient creatures. Like most of the great powers, the position of the Midnight Hags in the Outsider political ecosystem is reliant upon incredible technological sophistication. In them, inventor and machine are truly unified – the Seraphim, perhaps, are the only beings that display a similar unity of thought and form. Many of these inventions are part of the Hags themselves: augmentations to toughen muscles and sharpen reflexes, implants to improve memory, and delicate sensors to enhance their perception of the treacherous worlds and creatures with whom they treat. 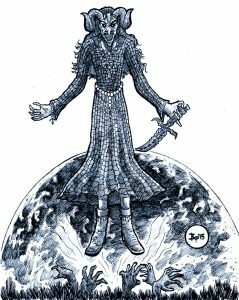 Others are more obvious; their “living coats,” the Khimeille, garments that appear to be made of interwoven plates of leather, are actually an ultra-hard but malleable crystalline material, and attack the hag’s enemies like living pets. Many bear the dreaded “fusil,” a hand-held weapon that throws small flechettes like a wall of arrows, thick and fast enough to shred mortal flesh. Their staves hurl gouts of flame, or drain the life from foes directly upon contact. Perhaps the most versatile wondrous items borne by Shaetemmu are the Vekh-mekhash, more colloquially “Hagseyes” or just “Eyes.” These are complex and extremely valuable magical artifacts that appear to be carved from jet that surrounds a hollow, fluid-filled core – some say the eye of a former victim of extreme power. Vekh-mekhash are perhaps the most advanced sensors created by any race, cap able of magnification sufficient to read a parchment on one of Veldon’s moons or to detect the nanite components of the Mechanus Swarm. This visual information is relayed directly to the Hag’s mind, allowing the creatures to disguise their Eyes as jewelry to spy on enemies. Some have even been surgically implanted into other creatures, a risky but efficient means of gathering intelligence. The Eyes also allow for efficiency in other ways; most Shaetemmu store their Eyes in their own gullets, swallowing them for safety when they’re not in use. These potent artifacts also act as key and door to the Midnight Hags’ forbidding demesnes. In this manner, the Hagseye may attune a portal to pass through the outer walls and as the key that allows that special portal’s use. A Hagseye would be nearly priceless were it not impossible to obtain them; they are never made for or sold to other creatures. Stygian travel, too, sets the Shaetemmu apart from their rivals and trade partners. Their “Witchvessels” are unmatched, the only means by which any creature may pass through the Styx unscathed. No comparable ships are made in the whole of the known Universe. Only a Witchvessel can stand up to the corrosive energy, crushing gravity, scrabbling Netherlings, and the cold void of the Stygian environs. More secret still is the means by which the Hags obtain their most precious commodity, the essence of their wealth … Larvae. Larva production is so jealously guarded that not even the neural tissue of their Undead servants can be torn apart for the secret. All that is known is that the Hags consume Lemurian Souls whole, like oozing fruit, and expel Larvae in a perverse mockery of birth. The Undead themselves are also a testament to the race’s necromantic mastery; each individual has teeming worlds of the creatures at its disposal, with strange bodies and stranger powers limited only by cruelly perverse imaginations. Various sages have contributed to an extensive catalog of some fraction of these myriad of forms. The noted traveler Lin’Chi, for example, has recorded in the SCRY archives an encounter with the Shaetemmu called Bukhet, the Black Web. Ferried through the Styx on its Witchvessel, he directly observed powerful, magic-wielding Undead with disturbingly spider-like forms. 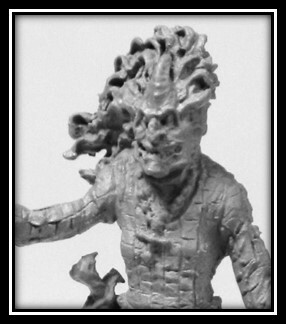 These “Knepf” look to have been stitched together from the parts of humanoids and spider-kin, likely dread Dire spiders of the Daemon Paragon Khabissol, the Spider Queen. The ship swarmed with other creatures beyond these mighty constructs: decapitated heads adorned with the legs of scorpions, hulking chain-stitched giants that seemed to grow and shrink subtly from moment to moment, and brutish centipede-like bodyguards that the Hag affectionately referred to as “Ixatopf” or “Ixatomma“. Lin’Chi speculates that Bukhet has a materials contract with Khabissol for the flesh of the dead. Other scholars have noted similar Outsider-influenced Undead designs, such as Undead with crystalline limbs derived from Hellion flesh or even the elegant filigreed steel of Mechanus technology. The number of forms appears to be truly endless. Shaetemmu are masterminds, and like other creatures both ancient and cunning are seldom forced to engage in true combat. The challenge of killing one of the Shaetemmu is as much in finding the creature as it is the fight itself. None do business except by simulacra or holographic communication, and their palaces don’t even have doors – they enter and leave by means of personal portals through the stone. Would-be assassins must travel through a gauntlet of vicious undead, some with powers and strength rivaling true demons. It is rumored that Hags who anticipate the threat of such treachery will create Undead from the remains of the attacker’s slain family or friends. Disruptions in the spatial fabric of the palace walls alerts the Hag to intruders (if not already aware), and allow the Hag to redirect the passage into the bowels of a dungeon or other trapped and sealed oubliette. Those that manage to bring a Midnight Hag to bay must pierce complex illusions and brave centuries-old traps of great ingenuity before coming to grips with the creature herself. When finally forced to fight, Hags refuse to dirty their own hands. Most will just levitate slightly out of reach, unmoving, allowing their living robes and undead servants to protect them. Under pressure, they activate dormant simulacra to attack, often sacrificing themselves in ingenious ways to neutralize the Hag’s foes. Their strange blunt knives also come into play, their latent powers activated to make them dancing, magic-edged tools of slaughter. Though Shaetemmu have the physical capacity to defeat most enemies of mortal and immortal origin alike, a racial distaste for both movement and personal effort make them almost unable to physically attack other creatures. Their oft-spoken-of iron claws are anatomical oddities, kept for the sake of show. In the extremity of need, a Hag may summon one of the Death Masters – but this occurrence is rare, and the creatures prefer escape to owing any being a favor. 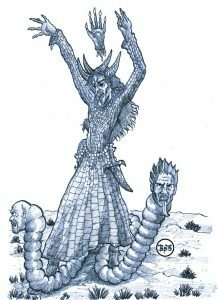 Hags know all mortal and outsider races well, and have no allies – an easy position to maintain when racial loyalty is as antiquated a concept to them as the blade or the bow. Each dedicates a significant proportion of its time and resources to study what is truly perceived as its greatest threat – every other Hag in existence. To this end each Hag engages in intricate machinations meant to keep the others at bay or to bring them low. After eons of conflict in the shadows, the game has become more a matter of show and economic intrigue than a true war of assassination. The race exists in a tenuous but ubiquitous détente; no Hag will ever harm another willingly, nor her simulacra or Undead destroy. Their armies have become extensive networks of spies, and their assaults are done by proxy. The most effective method by which the Grey Ones discredit and diminish their rivals is through the instigation of wars amongst the rivals’ clientele, wars that have been known to end whole civilizations. Rare gatherings of Shaetemmu associated by trade or by their Death Lord patron are rife with subtle trickery and outright deception, games of prestige even amidst serious discussion. These gatherings sometimes result in new feuds or contests of skillful deception in which souls or even contracts with powerful Outsiders may be wagered. Midnight Hags are most often encountered on trading trips or in Hades itself; they rarely leave for any reason other than economic self-interest. Those encountered beyond the bounds of Hades are remote-controlled simulacra, similar to marionettes. They are far easier to destroy than the true Hag, lacking something of their creator’s extraordinary sensory capacities and reaction time. Encountered beyond their own palaces, Shaetemmu are predatory and paranoid but never openly hostile; attacking other creatures unprovoked, after all, is no way to get paying customers. They are willing to obtain nearly any item for a price, but that price is unbelievably steep. 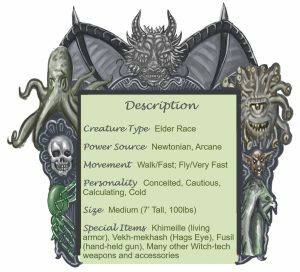 They may be summoned easily with standard thaumaturgic equipment, but the conjuror is warned to take exceptional precautions – the Shaetemmu are past masters of conjuration, and more adept than most creatures at escaping confinement. Negotiation with them is exceptionally difficult, given that they regularly treat with Outsider lords. Their senses are so fine-tuned that they are able to read mortals like a child’s nursery rhyme, revealing intention and deception with ease. Many mages wisely wear masks during such negotiation. Encountered in their own realms, Shaetemmu are automatically hostile. Paranoia is a racial trait that has survived through millennia of backstabbing and traps – allowing the residual Hags to survive. Those that manage to enter a Hag’s palace should be prepared to kill the creature or be slain themselves, as the Hag will not allow intruders to escape with such intimate knowledge of its inner sanctum. Most spend a significant amount of time sitting motionless in a “throne room” of sorts among the dozens of simulacra that are used to interact with the outside world, and even within its own home to conduct experimentation and to distribute orders to the slaves. These beings do not favor mortal company, but have been known to enslave other creatures with mind magic and twist them into utter obedience. There is no interaction with one of these ancient terrors that has not been analyzed, planned, and plotted to come out in the Hag’s favor. The Shaetemmu are better avoided, no matter how desperate mages may be.